A timely message from a timeless messenger. Proverbs 26:12 doesn't pull any punches. What a solid rebuke to our nature. There have been times when I thought pretty well of myself. Those are the times when I am actually at my worst in the Lord's eyes. I seek comfort – He invites me to join in his suffering. I like acceptance and approval – He calls me to be counter-cultural. I assume my right to safety – He calls me to personal risk. I desire financial security – He encourages generosity. I cherish privacy – He invites me into community. I hide for fear of being judged and rejected – He knows me fully and loves me. I really like my pillow – He had no place to lay his head. I want to prolong a healthy life – He calls me to die daily. I hide in macho male bravado – He weeps for others. I love good regular meals – He feeds others. I ponder doctrine – He practices love. I crave success – He wants me to oppose evil at all costs. I seek out important people – He befriends the despised and rejected. But what I find deep within me is much worse. The Question is, of course, will you allow the Lord to use you in the ways that please Him? This post will be short, but please do not dismiss the importance of the message because of the brevity. Look at this picture… do you see anything that catches your attention? 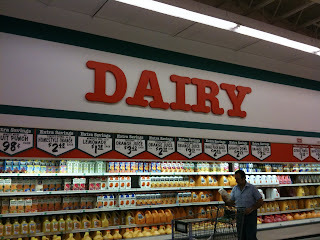 For those who may be wondering, no... orange juice is not a dairy product. Did I snap this picture while they were in the middle of a transition? Yesterday was an incredibly wonderful day. I have taken a break from riding my stationary bike in the living room (yes… in the living room… that’s where the TV is.) So I grabbed the iPod that kept me sane while working alone in a warehouse and hit the streets. The weather was so great outside! I noticed people driving very different vehicles. Some were large and full of people and some were large and only carried the driver. Some were small and stuffed with passengers and some were small and… well… you get the point. As I walked I began to wonder about the people driving the cars. A car’s main function is to do the bidding of the one who controls it - the driver. Some have luxuries and others are falling apart, but since the creation of the automobile, cars have had one main job… carrying stuff (people and possessions) from point A to point B. As we read the creation narrative and then take a look at the Life of Christ, one of the things that jump out as being primary is that creation was designed to serve the creator. Sin has, of course, marred all that. What or Who is driving you? Some one or something other than God. Following God's will is not like bathing a two year old while watching your favorite TV show... There are not conveiniant places to start. But it is like Godly parenting in that though the process may be difficult, it is none-the-less worthwhile! Consuming thoughts these last two days. ﻿keep my commandments, and live. The fifth chapter begins with another call to "PAY ATTENTION!" As if that were not enough, chapter 7 is devoted to the ways of immoral women. He wrote the book of Proverbs to/for his sons specifically. (Proverbs 1:8 and elsewhere.) His sons are royalty and he desires to share wisdom the Lord has allowed him to benefit from, and experience to avoid. If you are in a relationship that needs to be secret... you are in the wrong relationship. I used to work out, a lot. One day, after years of not doing crunches, I decided to start up again. “I can pick up right where I left off.” I thought to myself. I was wrong. The day after my workout my abdominal muscles were very, very sore. Flash forward another couple of years. When my family and I vacationed in Miami last February we took full advantage of the giant trampoline in my in-laws’ backyard. I was jumping for hours on a huge trampoline with my kids (mostly Sammy). Need I say that my abs were KILLING ME? Well, they were. I was sore just from enjoying the day, not from battling fat in the gym. I wonder how my spiritual muscles would fair against a real battle . . . a real war. I wonder if they would be sore, or would they be in great shape and prepared for the task. The good news is, as believers in Christ, we will all find out how “in shape” we are. The bad news is, some of us will be too sore to fight.